Luiz Vazquez was today's Cabot Cheese Extra Sharp Player of the Day. 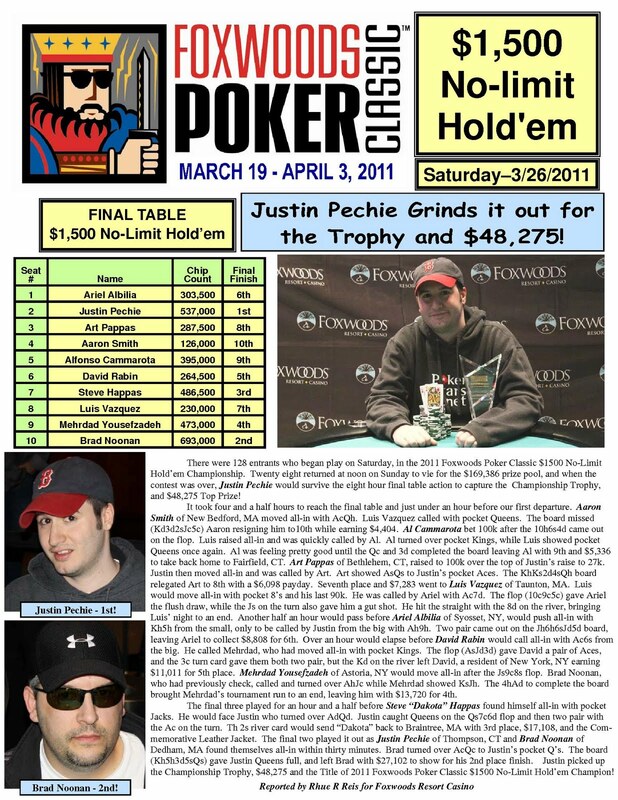 Luis bested a field of 171 players to win the $600 NLHE Deep Stack event at the 2011 Foxwoods Poker Classic. Luiz took home the trophy, leather jacket and $16,300 for his victory. The final three players in the $600 NLHE Deep Stack event have come to an agreement on a three-way chip chop. Luis Vazquez is officially the winner and takes home the trophy, leather jacket and $16,300. 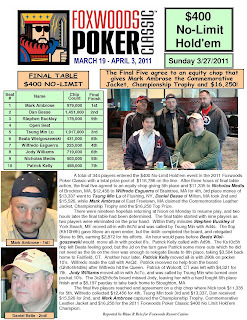 The board came [Ts][8d][5h][3c][4h] and Shpur's kings held to eliminate Opie in 4th place for $6,945. $300 NLHE Deep Stack is in the Money! We are down to the final 40 players in the $300 NLHE Deep Stack event. 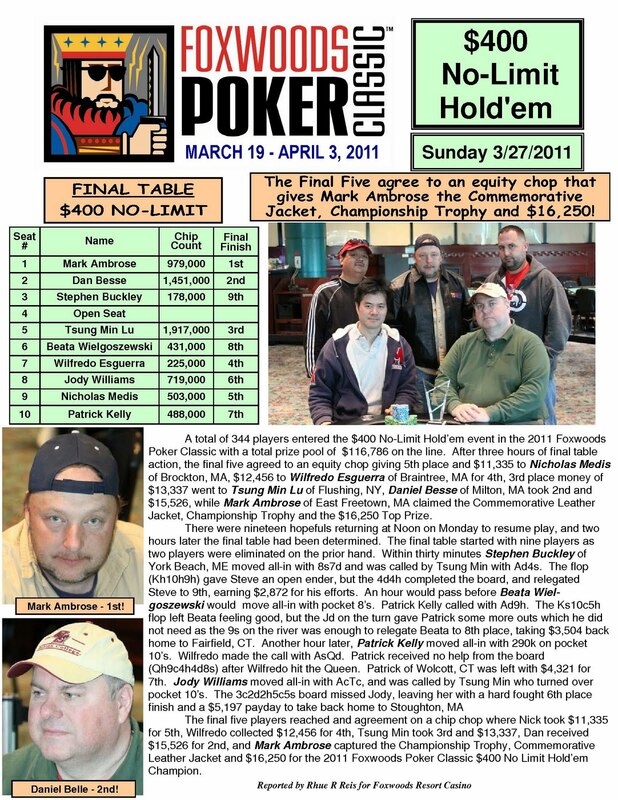 All players are now in the money and guaranteed at least $643. We had a total of 66 players in the $400 Pot-Limit Omaha event. The board ran out [Js][9d][2d][2h][Kc] and Vazquez won the pot to eliminate Vazquez in 5th place for $5,055. Joseph Opie raised to 34,000 before the flop and Luis Vazquez three-bet to 134,000. Jeff Taitz made the call from the button and Opie folded. The flop came down [9d][9s][4s] and Vazquez moved all in. Taitz immediately made the call and flipped up [Ah][6h]. Vazquez turned over [As][Qs] for a better ace with the flush draw. The turn came the [8s] and Vazquez locked up the hand with the flush. A meaningless [5d] came on the river and Taitz was eliminated in 6th place for $4,132. The board ran out [Tc][Th][3h][4d][Ac] and Opie caught an ace on the river to win the pot and send Cronin home in 7th place for $3,560. Both the $600 NLHE Deep Stack and the $300 NLHE Deep Stack events are on one-hour dinner breaks. Vazquez's pocket fours were good enough to take the pot and eliminate Goodwin in 8th place for $3,121. 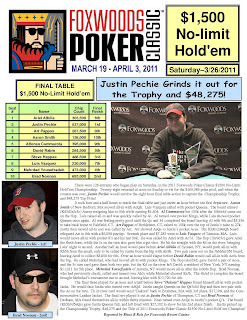 The board ran out [Tc][Td][5h][Ac][6d] and Shpur won the pot to eliminate Cohen in 9th place for $2,597. The $400 Pot-Limit Omaha event is well underway here in the tournament area. Final numbers will be posted shortly. Dan Rovner got his last few chips in before the flop with [Ah][Kc] against the [4c][4d] of Luis Vazquez. The board ran out [9d][7s][3c][6s][6h] and Rovner was eliminated in 10th place for $1,758. $600 NLHE Deep Stack is in the Money! We are down to the final two tables of the $600 NLHE Deep Stack event. All 20 remaining players are now guaranteed at least $1,494. The average chip stack is now 171,000 with the blinds at 2,500-5,000 with a 500 ante. We had a total of 375 players in the $300 NLHE Deep Stack event. Day 2 of the $600 NLHE Deep Stack event is now underway. There are 33 players remaining and the average chip stack is just under 104,000. The blinds will be starting today at 1,500-3,000 with a 400 ante. With registration still open, there are now over 300 players registered for today's $300 NLHE Deep Stack event. The blinds are currently 50-100. Players started with 15,000 in chips.